← The Daily Bite and is it a Lapse, Relapse or Collapse? 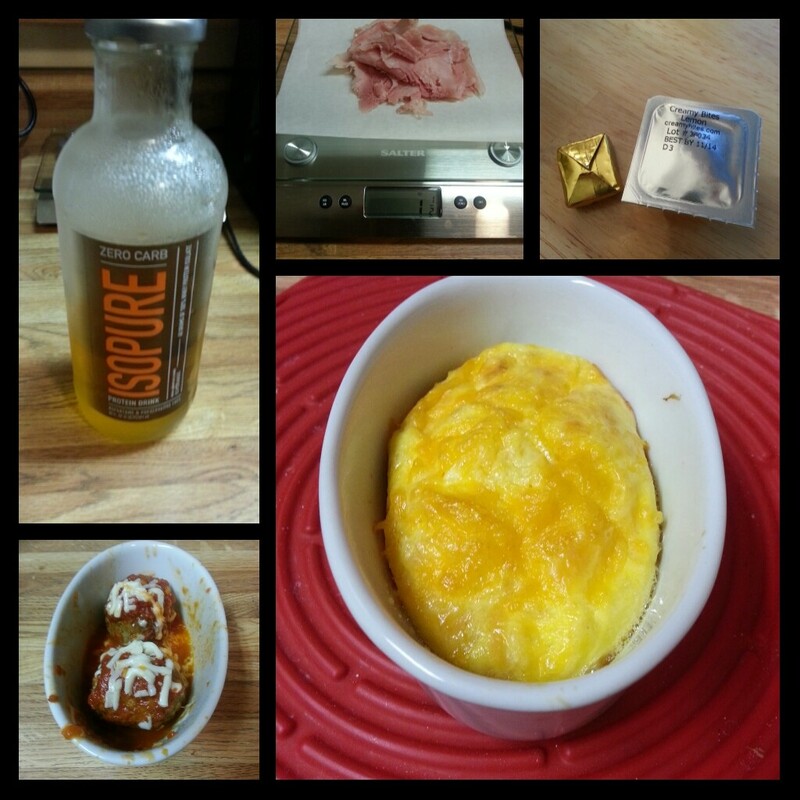 Today’s food choices, clockwise from upper right: multivitamin and calcium supplement x2; crustless ham and cheese quiche (ate 3/4 for lunch); meatballs and marinara x2 (I had this for breakfast and dinner); Isopure Zero Carb (half bottle); 1.5 ounces Boar’s Head Virginia Ham (snack, with rest of quiche). I’m getting much better at listening to the cues of fullness my body uses to tell me enough…quit eating. I’m also using a tool my other therapist (yes, I have two…I figure I can use all the help and support that I can through this process!) suggested for me: associate that last bite/what’s left on the plate with an unpleasant feeling. So for me, that’s revisiting how I felt Wednesday afternoon after eating more than I should have: nauseated, heart racing, bloated and just overall gross. I don’t want to feel like that ever again. So now when I feel the heaviness and pressure, I put the fork or spoon down and get up and walk the plate to the trash if there’s not enough to make a snack of what’s left, or I bag it up and put it in the fridge for later. I don’t want to risk feeling sick after I eat again, because it was no fun! This week’s Friday Five is dedicated to soft foods I can tolerate. You may or may not be able to tolerate these things on your soft food diet, but these are the things I’ve eaten this week that I have been able to get down, keep down and that I really like. Next week, I’m going to get some boneless, skinless thighs and give them a try in the crock pot. As long as I can mush them up into a paste or run them through my food processor, I think it’ll be all good. Better still, I could mash them up with an avocado, lime and some spices and I bet that’d make an awesome chicken salad. Hmmm…. Preheat your oven (I used a toaster oven) to 350 degrees F. Either coat the bottom of a ramekin or creme brulee dish (I used a deep oval ramekin, pictured) with the oil or the Pam. You don’t want your egg to stick. Scramble the egg in a bowl, taking care to incorporate the yolk and the white while whipping as much air as possible into it–you want it to be fluffy when it bakes up. Pour the egg into your baking dish of choice. Measure out your ounce of ham and sprinkle it into the egg and top with the shredded cheese. Bake in the 350 degree oven for about 20 minutes, or until the egg sets up (you don’t want it to be runny at all). Serve hot. Nutrition info (from MyFitnessPal): 116 calories, 12 g protein, 2 g carbs, 6 g fat. This entry was posted in daily bites, post-op, vsg, weight loss surgery and tagged daily bites, eating, Friday Five, post-op eating, recipes, sleeve gastrectomy, soft foods, tiny plates, VSG, WLS. Bookmark the permalink.